Disney on Ice: Frozen tickets were just released, launching top trending sales across the nation, said Marta Ault at BuyAnySeat.com. Based on Disney’s latest Oscar-winning animated blockbuster, the touring cast is off on a 33-city tour hitting Providence, Richmond, Hampton, Nashville, Atlanta, Hershey, Fairfax, Baltimore, Uniondale and Brooklyn through mid-November after opening at the Amway Center in Orlando on September 5, 2014. 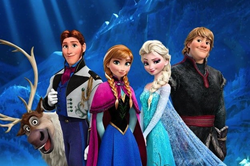 "Frozen", now the highest-grossing animated film of all time, hits the rinks as a Disney On Ice version with a 33-city tour opening in Orlando on September 5, 2014. Talk about hot. Adoring fans just can’t seem to get enough of “Frozen”, the 3D computer-animated musical fantasy-comedy released by Disney last November. Not only is it now the highest-grossing animated film of all time, the Disney On Ice version is set to hit the rink this Fall in Orlando. Inspired by Hans Christian Andersen's fairy tale “The Snow Queen”, the film tells the story of a fearless princess who sets off on an epic journey. Accompanied by a rugged mountain man, his loyal pet reindeer and a hapless snowman, the princess tries to find her estranged sister, whose icy powers have inadvertently trapped the kingdom in eternal winter. “Hoping to continue to capitalize on the red-hot film, Disney has licensed Feld Entertainment to produce "Frozen" as a live show including a cast of more than 40 ice skaters and snow effects,” said Marta Ault at BuyAnySeat.com. Disney On Ice is a series of touring ice shows that are produced by Feld Entertainment in agreement with The Walt Disney Company. Typically, new shows debut and play in North America for two years and then head on to Japan for the third year, and Australia, England, and other parts of the world for the fourth year. The shows are known for their combination of expert skating and choreography. Dressed as classic Disney characters such as Minnie and Mickey, Ariel, Sebastian, Belle, Merida, and Rapunzel – professional skaters perform polished routines and familiar scenes. They glide around famous fairytale sets, bringing the magic of Disney’s stories to life. Plus, it all takes place to the upbeat tempo of Disney’s popular tunes, which often spurs audiences of all ages to stand up and start singing and dancing along. Songs from the beloved princess movies are also featured, much to the delight of families of fans. The success of “Frozen” swelled Disney’s second-quarter earnings to four times what they were last year, thanks in part to stellar home video sales and a chart-topping soundtrack. It also continues to be extremely popular with guests at Walt Disney Parks and Resorts, and the princesses, Anna and Elsa, are among the most popular Disney characters guests want to meet, according to Christi Erwin Donnan, a spokeswoman for Walt Disney Parks and Resorts. To shop for cheap Disney On Ice: Frozen tickets, visit BuyAnySeat.com. To save to even more, enter coupon code "BAS2014" during checkout.